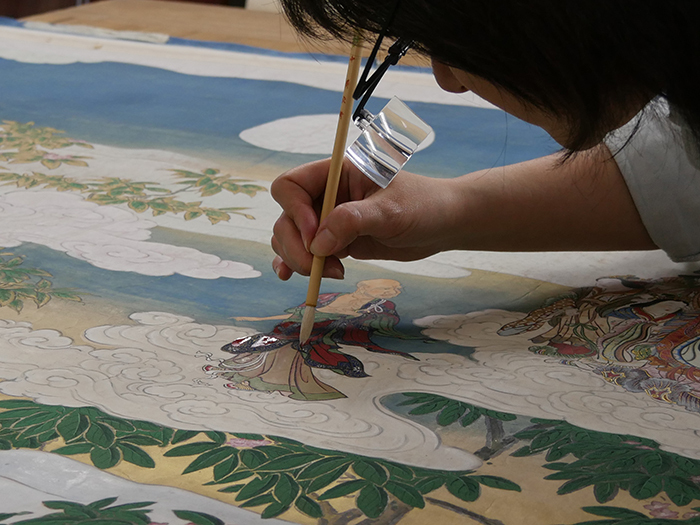 "If you visit the Museum of Fine Arts Boston these days, you can witness conservation in action on an enormous Japanese hanging scroll, which is currently being remounted in the Asian paintings gallery. Hanabusa Itchō’s masterpiece The Death of the Historical Buddha was painted in 1713 and entered the MFA Boston’s collection in 1911. Though it was last on view in 1990, the scroll hadn’t been treated since 1850. “Usually these scrolls are remounted every 100 years or so, which is why the project was a priority,” Jacki Elgar, Head of Asian Conservation at the museum, tells The Creators Project. As time goes on, scroll mounts can begin to fail or damage the painting, she explains—this is the most common reason for treatment. A painting might also become a candidate for remounting if the mount is inappropriate (for example, a 16th century painting that is mounted in a 20th century style), or if it was put inside a frame by a Western collector, in which case it can be returned to its original, hanging scroll format. At 10 feet tall by 6 feet wide, Death of Buddha is the largest scroll in the MFA Boston’s collection, and conservators knew the project would take some extra sets of hands. Lucky for them, the Smithsonian’s Freer Gallery is currently closed for renovations, so two of its East Asian painting conservators were able to travel north and join the effort. The MFA Boston began working on the logistics of the project three years ago, and hands-on work in the lab finally began in the spring of this year. In August, the scroll was moved to the Asian paintings gallery so the public could watch the process."